I’ll see your c7 and raise you a broken neck! Moments later, trying to avoid a driver fast approaching, Shaun wheeled for the right lane. But as our car reached a quarter way onto the right lane, he realized he misjudged the distance of the mini van in front of us. He quickly veered back onto the left lane but it was too late. The driver who kept flashing his light beams in a threatening manner, apparently cautioning his tail or else aggressively provoking us out of his way, initially prompted my Husband’s split-second lane change. Well, that speeding car ended up clipping our vehicle. We spun in a zig zag motion fast enough to flip our vehicle in the air and seemingly slow enough for me to witness the strange irony before crashing tire side down. We smashed the front end smack middle against a narrow concrete block that split our 2010 Camry into a letter Y. I thought I was dead. The fumes from the vehicle kept approaching witnesses in a frenzy as they motioned for us to exit the vehicle in case of fire. Unable to exit through the blocked passenger door, let alone remove myself from our collision, I was carried away from the wreckage. Luckily for me, an off duty Paramedic assisted the scene. Because of shock and unbearable burning, Shaun’s and my eyes intently focused on one another’s until our ambulance arrived. His sea eyes comforted me, tried to calm me from the shaking I mistook as shivers from the cold. Although I was assured of Grim’s safe distance between us, nonetheless his Scythe pained me. Later, air lifted, CT scanned, X-rayed, examined and treated, the worst was finally over. Aside from my fractured neck, mangled nerves to my hand and left foot, right ankle sprain, abrasions along my clavicle and bruises throughout my body, Shaun’s sore neck and back, we are so thankful our injuries weren’t much worse. Since the accident, I kept replaying the incident in my head, the warning signs, the what-if scenarios and the why us. It doesn’t matter though. We are here. Our car deemed a total loss but we’re not, we survived. The most unbelievable part is, I knew an accident was going to happen but I couldn’t do anything to prevent it from happening…. 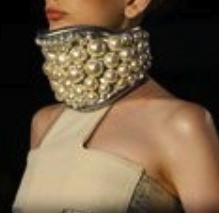 In keeping with good spirits, once I regain my grip, I’m going to embrace my neck brace and give it some style! Bedazzle it, fabric it, glue gun something cute on it. Might as well give my neck brace a fashion forward look as its my 24 hour/7 day a week accessory.